These bars are a nice treat. They are simple and delicious. The oven temperature is 350 degrees Fahrenheit. In a large bowl, mix the flour, oats, brown sugar, and baking soda. Cut the butter in the flour mixture until everything is crumbly. To cut in, use a fork, pastry blender, or work it in with your hands. Remove 1 cup of the mixture and set aside. Press the rest into the bottom of the cake pan. In a medium saucepan, combine the filling ingredients. Turn the heat down and cover. Let it simmer for 10 minutes or until the apples are tender. Take off the heat and spread the apples over the crust. Sprinkle the reserved flour mixture over the top of the filling. Bake for 30-35 minutes or until the top is golden. Let cool to slightly warm before cutting. If you want a small pan, halve the recipe and use a 9″ square pan. Ok Ruth–I have to try these! 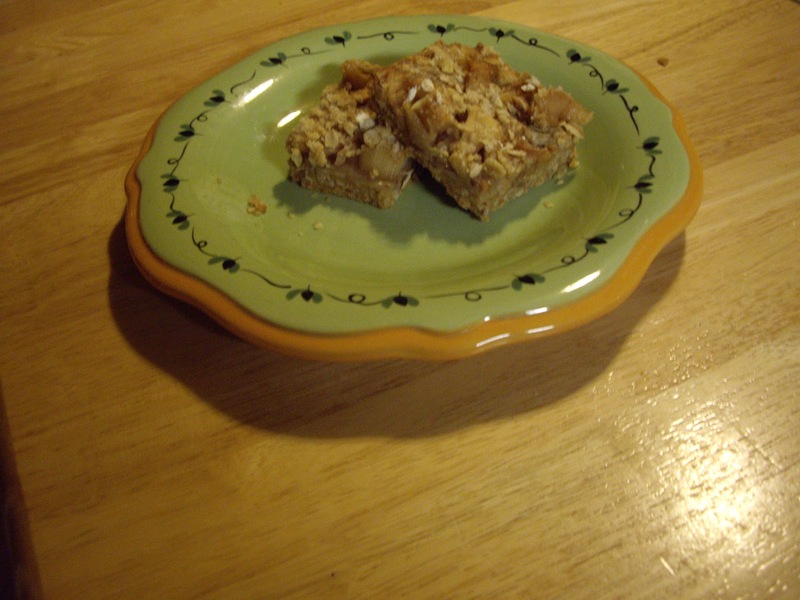 I love apples, and am looking for a good apple bar recipe. Thanks! I hope you like them. I just had one for breakfast. I have made something like this before, but I never used cloves. Maybe I'll try it your way next time. It was really delicious! Hi Ruth! I am stopping by blogs from the A to Z Challenge list to say hi and get acquainted 🙂 This recipe looks really good. I'm a sucker for anything with oats, butter and brown sugar! I look forward to your A to Z recipe posts! Thanks for stopping by Karen. I love oats too :). Looks like another delicious recipe! I bet your house smells really good with all the baking you do!